Whether you’re new to the concept of do-it-yourself moves or undertaken a number of them, Mobile Truck Rental have the trucks and equipment to help guarantee that your all your personal goods are transferred safely and efficiently at the prices that represent real value for money. Our fleet of Pantech hire trucks are perfect for personal and commercial purposes; in addition to house relocations, our trucks are a cost effective solution for relocating your small business. For a fabulous deal on moving truck rental throughout Townsville, get in touch with us now on 1300 799 317, fill our quote form or email us at info@mobiletruckrental.com.au and we’ll get back to you shortly. Typically, when you arrange for a one way rental, it’s your responsibility to deliver the rental back to the nearest yard or location, but with Mobile Truck Rental, we do this for you. We deliver the vehicle to your address at the agreed upon time and retrieve it from you once you’re finished with it, at your new location, at a time that suits you. It’s a tremendous convenience, allowing you to focus on what’s most important to you. We understand that customer care plays an essential role in determining the quality of their experience with us and in turn, the likelihood that they’ll choose us again or recommend our services to their family and friends. At Mobile Truck Rental, our highly trained staff always strive to go the extra mile to ensure that you receive all the information you need to enjoy a safe and memorable time with us. Chat with a member of our support team today and discover how our truck rental services can help you. Our rental trucks have been specifically designed for the purpose of hauling heavy equipment, furniture and other personal goods. Each vehicle is equipped with everything you need to get the job done quickly and with minimal hassle, including tailgate lifter, rope and trolley. Each cab is fully air conditioned as well, so you’ll always travel in comfort, even during the hotter months of the year. Customer safety is our number one priority and all vehicles are serviced regularly by trade certified mechanics to help guarantee that all rental trucks are at the highest standards of operability at all times. None of trucks are allowed to be leased until they successfully met all stringent requirements. Each Pantech truck has a storage capacity of 20m³, which is enough to haul the entire contents of a typical 3 bedroom unit in a single journey. Our vehicles have been carefully designed to make the loading and unloading process of your possessions as safe and efficient as possible. When lifting or moving heavy objects, it’s important to educate yourself on the correct way to go about it. We’ve created a guide on lifting heavy objects and loading and unloading, which we encourage everyone to read. Our truck rental packages represent the utmost in convenience and real value for money. When compared to the often outrageous costs of removalists, DIY moves are a great way to save big money. The great thing about our Pantech trucks is that you don’t need a truck licence to drive one. A standard C class open licence is all you need. They’re automatic as well, so even those unfamiliar with a manual transmission will have no problem driving one. Although slightly larger than an ordinary car, our 3 tonne vehicles are no more difficult to drive. That said, we still recommend that you take the time to look at our driving tips guide to help ensure the safest possible journey. 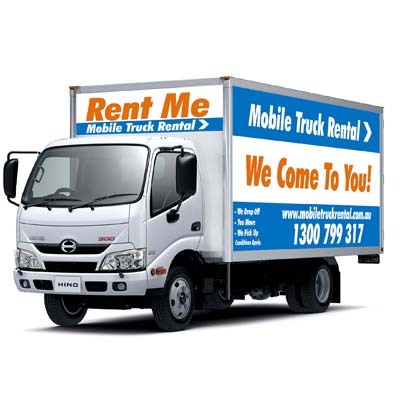 At Mobile Truck Rental, we make Townsville truck rental affordable. Our vehicles are all immaculately clean, maintained and serviced on a frequent basis and come fully equipped with all the gadgets you need to perform your transport duties in total comfort. Competitive rates with no hidden charges. Whether you require a removal truck for 3 days or 30, our team can create a customised truck rental package for you that is tailored to your precise needs, so you’ll never have to pay more than you need to. We offer exclusive discounts to clients for long term hire. The longer your rental term, the less you pay! Avoid paying outrageous sums of money to have a removalist do the work for you. Do the smart thing and hire a rental truck from anywhere in Townsville. You’ll be saving yourself a small fortune by doing so and our super convenient service ensures that you don’t have to waste time and money driving to the rental site to collect your vehicle or driving to another one when you reach your final destination. We do the collecting for you. We drop your hire truck off at your specified address and we collect it from you once you’ve finished using it. It’s that simple. For a free quote concerning removal truck hire throughout Townsville, contact the team at Mobile Truck Rental now!